Fifteen students from the College of Communication and Information Sciences Department of Journalism and Creative Media celebrated the launch of the seventh issue of Alpine Living magazine on Thursday. The semester-long, international magazine production experience takes place biannually and has been recognized nationally for excellence among peer publications. Last fall, an editorial staff of distinguished journalism and creative media students was selected to produce the 100+ page, full-gloss magazine, which promotes a different country each issue. This years’ magazine provides prospective travelers and curious readers with an authentic look at the history, culture and lifestyle of the New Zealand people. 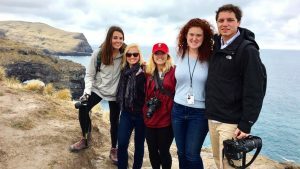 In March, the group of graduate and undergraduate journalism students traveled to New Zealand where they spent more than two weeks exploring three of the countries largest cities: Auckland, Christchurch and Queenstown. Students also visited Sydney, Australia, as well as several smaller towns and suburbs outside of the cities where they stayed. Stories from the New Zealand issue range from topics of food and wine to indigenous tattoo artists and native-species conservation efforts. The magazine, which is available in both print and digital format, is also intended to highlight aspects of the evolving journalism market and allow students the opportunity to learn new and innovative ways to practice the craft. Taylor Armer, a journalism graduate student and managing editor for the magazine, said her experience with Alpine Living was one she would not soon forget. For more information about Alpine Living Magazine, or to read their digital format, visit their website here. Alpine Living issue seven participants included: Taylor Armer, managing editor; Kaylin Bowen, writer; Mary Kathryn Carpenter, photography editor; Christopher Edmunds, art director; Elizabeth Elkin, writer; Thomas Joa, writer; Jonathan Norris, editor-in-chief; Mary-Margaret Schmidt, photographer; Elayne Smith, writer; Lane Stafford, photographer; Hailey Grace Steele, digital editor; Madison Sullivan, chief copy editor; Danielle Waddell, writer; and Cara Walker, writer. Dr. Kim Bissell, professor and associate dean of research for the College of Communication and Information Sciences, serves as the founding publisher and faculty advisor for Alpine Living magazine.